1st set. 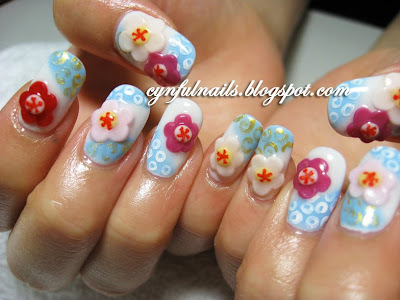 Kimono inspired nails! 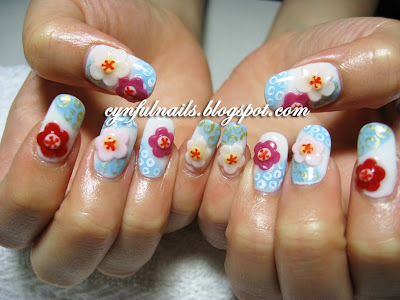 Nail design from Feb 10 issue of Nail Max. Modified the color! The white and blue part is done using gel colors. That's what I love about gel, no need to worry about color chipping! Unlike nail polish. hehehe. The most unique set of nails I've done so far. No crystals used, yet so eye catching! 2nd set. 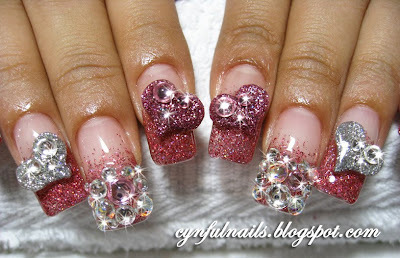 The ever so popular minnie mouse nails! Ok la, I know you all have seen this design soooo many times, but this is too cute not to post it again. HAHAHA! The pink candy bows are almost edible. Yums. See! I told you it's too cute already. I ♥ it. Enough said on the blingness and the ♥s. 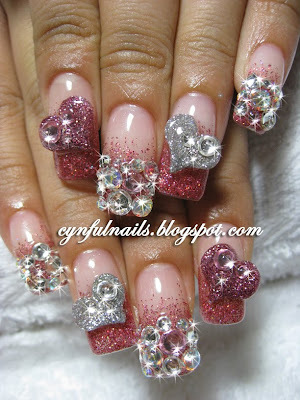 Valentine's day and CNY nails. All combined. If you ever visit Stockholm Sweden, please let us readers now.